The announcement of an agreement by the United States and Russia on a possible temporary cessation of hostilities in Syria is a positive development, though we are skeptical that this deal will hold or ever even go into effect. Until there are fundamental changes on the ground there will be no major breakthroughs in the negotiating room. And unless the United States is willing to significantly increase its support for opposition groups in Syria and take more risk in confronting both Bashar al-Assad and his Russian and Iranian supporters, it is hard to see an acceptable end to this that sets conditions for destroying ISIL and other extremist groups in Syria and Iraq. At the Center for a New American Security, we have been undertaking a review of current U.S. strategy towards ISIL, in which the Syrian civil war that stretches from Dara’a to Aleppo is one of three separate but interrelated theaters. Eventually brings the parties to the table to negotiate an agreement that ends the conflict. U.S. policy of disconnecting the battlefield from the diplomatic process is not working. As negotiations are unfolding, Russian and Iranian-backed Assad regime forces are increasing their operational intensity, slowly but seemingly inexorably seizing terrain from the armed opposition, especially from U.S.-supported rebel groups. This situation is influencing the negotiations because Russia, Iran, and Assad feel little pressure to make concessions. Meanwhile, feeling itself in a position of weakness, the Syrian opposition has taken a maximalist approach, demanding that the Assad regime adhere to U.N. Security Council-mandated conditions to halt destructive attacks against civilian areas, lift starvation sieges, and release political prisoners. The end result is hopeless diplomatic deadlock. But more than just relying on fruitless negotiations, current policy is also setting conditions for a prolonged bloody campaign where Assad over time retakes significant portions of western Syria, weakens the opposition, but leaves in place a highly violent and unstable situation in pockets around the country where extremist groups will continue to thrive. The Russians and Iranians are doubling down on support for their ally with the aim of strengthening an Assad statelet in western Syria that over time can regain control over most if not all of its territory. This strategy seems to be working. The Assad regime has made important inroads recently in the south, seizing the key stronghold of Sheikh Miskeen. It is also having an effect in the north, where the regime is on the verge of encircling Aleppo. The regime is in a better position today than at any other point in the conflict to dictate the terms of ceasefires and the lifting of sieges, or to game the diplomatic process in such as way as to preserve the rule of Bashar al-Assad indefinitely by military force. Meanwhile, the approach of the past few months is alienating Syrian opposition groups and U.S. regional partners, who believe that the United States has settled on a course that will allow the Assad regime to shoot its way out of the war. Accurate or not, this perspective is leading Syrian rebels to conclude that the United States and its regional partners have abandoned them and causing them to deepen their relationships with radical Sunni ideologues as the best alternative in Syria to fighting the Assad regime. This approach strengthens both Assad and the most radical Sunni groups, while marginalizing more moderate opposition forces. Without a fundamental shift on the ground in western Syria, the Assad regime and its allies will drive slowly and inexorably toward victory. U.S. leverage to shape the direction of the rebellion inside Syria will become weaker and weaker with each advance by the regime and its allies. The more that the United States loses its ability to strengthen moderate Syrian opposition elements, the greater the risk that conditions entrench the social, political, and military power of radical Sunni extremists — both ISIL and non-ISIL. Instead of so aggressively pursuing negotiations, U.S. strategy in Syria and Iraq must start by changing conditions on the ground first before negotiations can proceed productively. U.S. actions should aim to fill the security and governance vacuums with acceptable and sustainable alternatives that eliminate safe havens for those who threaten the United States and its partners with terrorist attacks and regional destabilization. This means shifting from an approach where the United States focuses on whom it is against (Assad, ISIL, Jabhat al-Nusra) to one that emphasizes whom it is for. Otherwise, it risks pursuing a strategy that defeats one enemy but yields to another. A bloody Assad takeover of Syria, for example, would not only be horrific from a humanitarian perspective but would lead to perpetual instability and permanent pockets of extremism. Therefore, the first phase of any American policy must be to empower acceptable elements in the Syrian opposition so that they can become the center of gravity for rebel forces on the ground. The good news is that some of this already happening. Throughout western Syria, U.S.-supported armed opposition groups are using U.S. military assistance, especially BGM-71 TOW anti-tank missiles, to strike at Assad’s forces and their allies. But the United States will need to go further and scale-up and institutionalize support for the most successful Syrian armed opposition organizations. The most successful model is in southern Syria, where the United States has worked closely with Jordan to build up the Southern Front coalition. 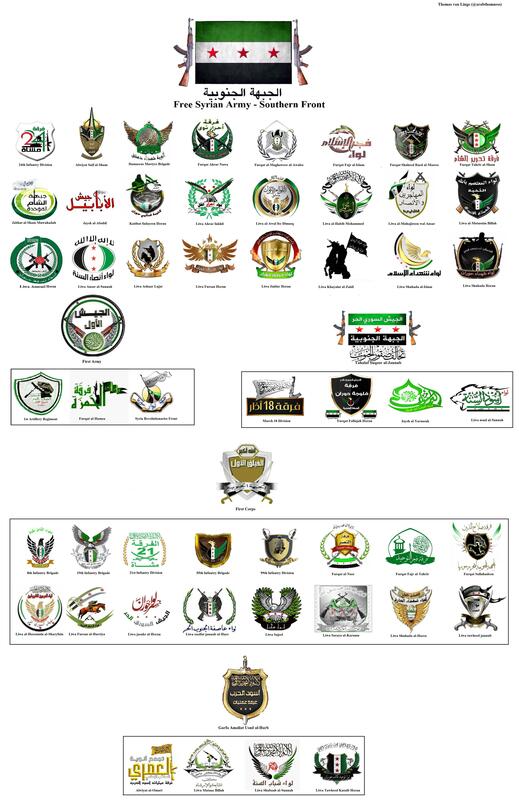 Another successful model is the Jaysh al-Nasr (Victory Army) coalition with an active presence in Hama, Idlib, Lattakia, and Aleppo governorates. Due to U.S. and Jordanian efforts, the Southern Front is a working, although by no means perfect, alliance of more than 40 relatively politically moderate armed opposition forces that operate from the Damascus suburbs to the Syrian–Jordanian border. Since its formation in February 2014, the Southern Front has consciously sought to link its military actions on the ground with an inclusive political platform that is acceptable to U.S. policy while simultaneously developing into an effective coercive force against radical Sunni extremists in that part of the country. Because of the Southern Front’s effectiveness, it has also been able to unify many smaller armed opposition groups into a more cohesive fighting and political force. The Southern Front is now putting significant energy into increasing its presence near Damascus to apply pressure on the Assad regime and to strengthen its collective deterrence against radical Sunni groups in southern Syria, including against ISIL and to marginalize al-Qaeda. It is important to remember that the Southern Front is far from a perfect partner. It does continue to maintain relations with ideological extremist actors such as Jabhat al-Nusra and Ahrar al-Sham. These relations generally exist to prevent internecine rebel conflict because frequently Southern Front affiliates and local fighters from the ideological extremist groups belong to the same tribe, clan, and extended family. In spite of this deconfliction with Jabhat al-Nusra and other ideological extremist actors, the Southern Front remains the most powerful and moderate opposition force in southern Syria and far preferable to many of the other potential alternatives. However, since the Russian intervention, the Southern Front has been losing ground due to the advances of the Assad regime and its allies. Russian and Assad regime air and artillery power are having a major effect on the Southern Front and the rebel communities from which it draws support. Emboldened by Assad’s gains and the weakening of the Southern Front, radical Sunni extremists are testing the strength and conviction of more moderate rebel groups. The United States can and should do more to help the Southern Front by reducing its vulnerability to air attack and building up its institutions into a real rebel army capable of taking the fight to the Assad regime and Sunni extremists. But for any of this to work, the first step must be eliminating regime air superiority in Southern Front-controlled territory. Without that step, it will be impossible to insert American or foreign special forces who can increase training and support and further strengthen the Southern Front’s capacity. Addressing the Southern Front’s vulnerability to air attacks would ideally be done in agreement with Russia. The United States should engage Russia to agree not to treat the Southern Front as an extremist group and to cease air attacks on it, while the Russians pressure the Assad regime to do the same. This is probably a long shot at first as the Russians’ current strategy is to use Assad to reestablish stability inside Syria and the Southern Front is a threat to Assad. But it is worth trying since the Russians are ultimately more interested in stability in Syria than in preserving Assad, who they simply see as the most useful tool for stability. Still, it is more likely that the Russians will continue their current course of action, believing that the United States is unwilling to put more skin into the game in Syria. In that case, more direct military intervention in southern Syria to assist the Southern Front may be necessary. One option to consider would be for the United States to declare a “no bombing or strafing zone” over Southern Front-held territory, which would be much less risky and resource intensive than a no-fly zone but come with many of the same benefits. The aim of this zone would be to deter Russian and Assad regime airstrikes against the Southern Front and local supporting communities. This should also potentially include Syrian regime barrel bomb attacks that are terrorizing the local population, but at a minimum must stop the types of Russian air support that has been so harmful to the Southern Front on the battlefield. Under such a plan, the United States would declare that any attacks would be met with targeted strikes with standoff weapons against Assad regime targets. This would not require the United States to obtain air superiority or take out Syrian air defenses because it would not require sorties over Syria. Unlike a no-fly zone, it would not require a sustained and costly commitment of airpower. It would also purposefully avoid Russian targets, thus creating a proportional response: Russian strikes on American proxies would result in American strikes on Russian proxies. The Russians and Syrians would likely test a no-bombing zone and force a U.S. response. A robust American response against regime targets would demonstrate to Russia and Syria that attacks on the Southern Front are counterproductive, however. Once they saw the United States was serious, this could likely be parlayed into an understanding with the Russians to not target groups supported by the United States, and break the regime’s air superiority in the south. A no-bombing zone would also send a powerful signal to U.S. partners and the Syrian opposition about a shift in American engagement. If the United States were to successfully establish a no-bombing zone, it could then increase its support for the Southern Front through more direct actions, including inserting American, Jordanian, or Emirati special forces to provide additional support. It could also give the Southern Front more assistance in building out governing institutions in the territory it controls. But again, none of this is possible as long as the south is under constant aerial bombardment. The situation in northwest Syria is much more difficult to address than in the south, with extremist groups holding the upper hand in many areas. While there are acceptable rebel coalitions like Jaysh al-Nasr that receive sustained U.S. support, they are not in a leadership position in the wider armed opposition movement. Moreover, in southern Syria, Jordan has been a responsible actor who has controlled the border and worked assiduously to empower moderate groups. But in the north, the Turkish border is a free-for-all. Coordination between the United States and its partners has been lacking and arms and money from Turkey, Qatar, and wealthy, private Gulf state individuals have made their way to extremist groups. Turkey’s concern about American support for the Syrian Kurds fighting ISIL has limited its willingness to work and coordinate with the United States. Turning Turkey may be the single biggest challenge in this approach. However, increased American intervention and investment in the opposition and the potential promise of a no-bombing zone in the north, similar to that in the south, would be a compelling carrot for the Turks as would a firmer stance by the United States against the Russian intervention. The United States should reassure Turkey that its investment in the Syrian Kurds is limited to helping them regain and hold their own territory that was taken by ISIL — not expand further. But the United States should also make clear to Turkey that if it cannot help build moderate Sunni opposition groups in northwest Syria to seal the Turkish border, the United States will have no choice but to invest more in Syrian Kurds to finish cutting off the border in order to fight ISIL and protect American interests. This combination of reassurance and threat can apply some pressure on Turkey to comply. If the United States is able to pursue the approach outlined above, it can, after some time of empowering and consolidating moderate Syrian opposition groups, push for a sustainable and acceptable political settlement where extremists are marginalized in a future Syria. Such a settlement would turn Syria into a decentralized state. The Northern Front, Southern Front, regime, and Kurdish territories would each have their own local security forces and a governing agreement would need to be reflective of that reality. Assad would likely have to leave eventually through a managed transition because that would be a red line for the opposition, though it should not be a hard red line for the United States. The bigger challenge will be how one defines the regime and how many other regime leaders would need to leave. If the United States is more deeply invested in addressing the conflict, it should not be too challenging to get America’s European and Arab partners to buy into this end-state. The Russians will likely resist at first and keep pushing for a full Assad victory. But once they recognize that the United States is more deeply committed to tilting the balance of power on the ground, a power-sharing system where extremists are marginalized and a protected Allawi statlet remains part of Syria should be acceptable. It will be more difficult for the Iranians to accept such an outcome, but if the Russians come around it will be hard for the Iranians to resist. Iran’s core interest is to keep supply routes open from Damascus to Hezbollah, which would likely not be eliminated in such a scenario. Finally, the hardest to convince will be the Syrian parties to the conflict themselves — both the regime and the opposition. But if the United States can first build the moderate opposition from the bottom up and then build the international unity described above, it may be able to eventually force all of the parties to agree to a political settlement that ends the war. Most important for U.S. interests, ending the Syrian civil war would remove a major catalyst for recruiting and training Islamic extremist fighters, who often carry their skills far beyond Syria’s borders. Successfully negotiating a resolution to the Syrian civil war requires a much more assertive strategy. The United States needs to shift the military balance of power on the ground to reduce the demands of the Assad regime and its allies at the negotiating table and demonstrate to Syrian and regional partners that the United States is a credible ally. As U.S. influence on the ground increases, it can then be leveraged to build more unified, coherent, and militarily effective moderate armed opposition groups. Strengthening moderate opposition elements is critical to both achieving a positive diplomatic outcome and pushing back against ISIS and other more radical groups. But the United States will need to escalate its support for acceptable armed opposition groups first in order to get to the point where de-escalation in the fighting can occur and the diplomatic process has a greater chance of success. Even with all of this effort, the United States will need to concurrently pursue a complementary strategy for dealing with ISIL-controlled territory in western Iraq and eastern Syria, which will be covered in our next installment in this series. Ilan Goldenberg is the Director of the Middle East Security Program at the Center for a New American Security where Nicholas A. Heras is the program’s Research Associate. Paul Scharre is a Senior Fellow at CNAS and a former Army Ranger with service in Iraq and Afghanistan.